Pavilion fees must be paid in full when reservations are made. 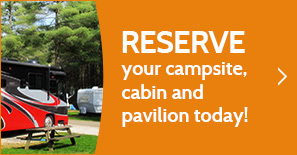 Reservation fee does not include the Lake Park Service Charge. The Lake Park Entrance Fee is paid at the Park Entrance Station upon arrival and is in effect from Memorial Day weekend through Labor Day. Check in 8 a.m. / check out 9 p.m.
Fees: See the pavilion rate brochure.